A rich history and thriving culture demonstrate the craftsmanship, artwork and history that help make La Paz unique. 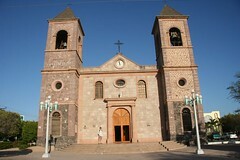 built by Jesuit missionaries in 1720. Across the street the Plaza Constitucion. includes artifacts and fossils of the region. The gift shop sells ceramic pieces and replicas of Aztec, Toltec and other pre-columbian people’s art works. Interesting and not expensive pieces; some are handmade, some are from a cast or mold. The museum is Within walking distance of Los Arcos, especially for some exercise! delicately colored ceramics from their work studio in front of their home. Mrs Ibarra paints the plates, bowls, plaques and more in a variety of geometric, Aztec and floral patterns. You can buy from the shelves or order custom made pieces. musical and theatrical presentations. While no extended calendar is available, you can contact the box office or see a local newspaper for the current schedule. 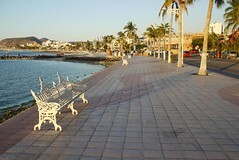 features a cactus garden exhibiting the native Baja flora. for lunch at Cafe Santa Fe or Hotel California to fuel up for viewing all of the various galleries. 15 Plex with first run movies many in English with Spanish subtitles.